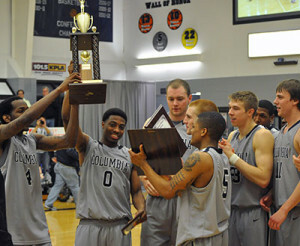 The top-ranked Columbia College Cougars men’s basketball team claimed the American Midwest Conference (AMC) tournament championship for the second straight year with a 77-63 victory over Park (Mo.) University on Tuesday night. Columbia improves to 33-0, establishing a new school record for victories in a single season, and also receiving an automatic bid to next week’s NAIA National Championships in Kansas City, Mo. The Pirates (21-9) will await the release of the national tournament bracket in hopes of an at-large bid. The Cougars dominated from the opening tip, starting both half’s with a 10-0 run and not allowing the Pirates to gain any ground throughout the game, jumping out to a 43-33 first half advantage. Columbia just kept rolling from there, going up by 20 in the second half, shooting 46 percent for the contest and forcing 12 Park turnovers resulting in 21 points. The Cougars cruised to victory in the final minutes, putting an exclamation point on an amazing season. The NAIA National Tournament seeds and pairings will be announced on Wednesday, March 6th at 7:15 p.m.